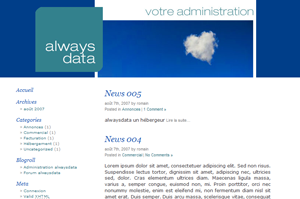 alwaysdata | blog » Beautiful and brand new! make every­thing sim­ple to use and intu­itive. Achieving that last point is the rea­son why, over the past few months, we have been striv­ing at improv­ing the user’s expe­ri­ence by sim­pli­fy­ing the alwaysdata’s graph­ic char­ter, both visu­al­ly and ergonom­i­cal­ly. You’ll find more uni­for­mi­ty to nav­i­gate the site with greater ease: all our pages now sport the same col­ors, in con­trast with the pur­ple / blue / green sig­nage that we used to have in V2. Hence, on all of our tools (our web­site, the admin­is­tra­tion pan­el, the blog, the forum, the doc­u­men­ta­tion, etc.) you will find the same nav­i­ga­tion ele­ments to ease your tran­si­tion from one tool to the oth­er: the nav­i­ga­tion bar at the top, and the foot­er that con­tains use­ful links. Also note that our logo has been sim­pli­fied for bet­ter inte­gra­tion wher­ev­er it goes! And as said above, it now comes in only one col­or; it’s sim­pler, isn’t it? Besides the shared offers we pro­vide, it’s been some time that, unbe­knownst to most, we admin­is­ter ded­i­cat­ed servers for some cus­tomers. It is an activ­i­ty we like, and we have grad­u­al­ly inte­grat­ed it with always­da­ta: those cus­tomers now enjoy both the ben­e­fits of shared servers (a con­ve­nient inter­face to man­age their accounts, their box­es as well as their envi­ron­ments) and the per­for­mance of a ded­i­cat­ed one. So today, we offi­cial­ly launch this new offer­ing, which we call “man­aged ded­i­cat­ed serv­er”, and where var­i­ous con­fig­u­ra­tions are avail­able. Details can be found at on our new web­site. Obviously, and this is specif­i­cal­ly men­tioned on the site, we can in the same way imple­ment and admin­is­ter archi­tec­tures that would require mul­ti­ple servers, to cater for more spe­cif­ic needs. In these cas­es, it is what we call “cus­tom host­ing”. It was bound to hap­pen one day, and it already has with our admin­is­tra­tion inter­face for that mat­ter: we will begin to inter­na­tion­al­ize things a lit­tle! Now, our web­site is also dis­played in the lan­guage of Shakespeare, and so is our blog (as of this arti­cle). Indeed, for some time now, we have been attract­ing new­com­ers orig­i­nat­ing from around the world (China, Canada, USA, Poland, Brazil, Argentina, Morocco, Italy, Russia, Spain, Ukraine, etc. 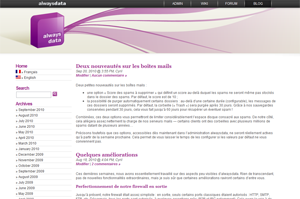 ), and it is incon­ceiv­able today to keep pre­sent­ing our win­dow (the site that presents our offers) only in French! Therefore, we focus, even more than before, on com­mu­ni­cat­ing more glob­al­ly, more inter­na­tion­al­ly, and on sys­tem­at­ic use of English for our var­i­ous ads. This will there­fore be the case on our Twitter, although tar­get­ed mes­sages can some­times be sent in French. Finally, we strong­ly rec­om­mend you send us any com­ments or sug­ges­tions you may wish to make about this new update; or even about any­thing else: we are con­stant­ly lis­ten­ing to you and always remain at your dis­pos­al!